Partly cloudy skies. Gusty winds during the evening. Slight chance of a rain shower. Low 37F. Winds N at 25 to 35 mph.. Partly cloudy skies. Gusty winds during the evening. Slight chance of a rain shower. Low 37F. Winds N at 25 to 35 mph. Leslie M. Smith, 59, of Bement, died at 6:59 a.m. on Sunday, March 3, 2019, at St. Mary’s Hospital. Leslie was born September 8, 1959 in Texas. She was preceded in death by her parents. 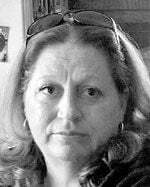 Leslie was an administrative assistant at Piatt County Mental Health Clinic. She is survived by her husband of 26 years, Thomas Smith of Bement; son, Luke Smith of Bement; two daughters, Jessica (Sean Hoover) Sears of Auburn and Melissa Eades of Springfield; and five grandchildren. Cremation will be provided by Butler Cremation Tribute Center. A private family graveside ceremony will be held at Chatham Memorial Cemetery where she will be laid to rest with her mother, Sharon Hohimer. The family of Leslie M. Smith is being served by Butler Funeral Home-Chatham, 8855 State Route 4, Chatham.